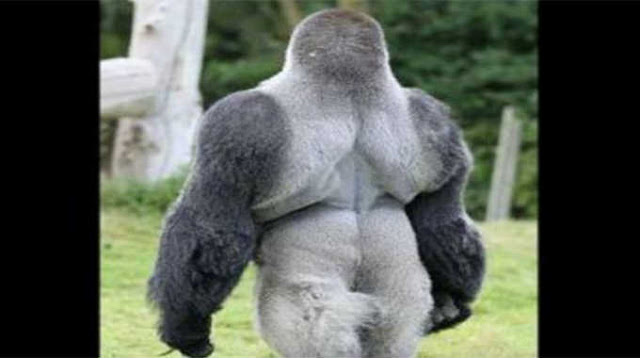 Home » other » This Gorilla Is Sweeping The Web.. When He Turns Around It’s Easy To See Why! Ambam is a silverback gorilla who lives with his family in Kent, England at the Port Lympne Wild Animal Park. In most photos Ambam looks just like the other gorillas, but if you watch him for a while you will see he has a special talent that truly makes him one of a kind. Ambam’s talent is walking upright on two legs, just like a human! At six feet tall and thirty-four stones, Ambam standing on his two legs is a magnificent sight. The zoo’s scientists believe Ambam learned this impressive trick all on his own, simply by watching and imitating the zoo keepers. His skills started out slowly. In the beginning, Ambam worked hard to balance on two legs. Once he had mastered that, Ambam took things a step further. Over time, he learned how to walk short distances. Now, much to the fascination of the zoo’s staff, Ambam can use his two legs to walk even greater distances. Ambam, the western lowland gorilla, has developed quite a large following after many of the zoo’s visitors recorded him walking all around his large enclosure. One of the videos that was posted by the park eventually went viral, and it was viewed by over a quarter of a million people! Ambam’s rapid rise to fame has significantly increased the number of visitors who come to The Port Lympne Wild Animal Park. The park has welcomed the influx of people who are coming from all over to see Ambam’s extraordinary ability.